If you can't wait for Ainol's $99 Ice Cream Sandwich tablet to show up in the United States, you might be able to find one online, but you should be aware of a few things first. Earlier this week, MIPS and Ingenic, the companies behind the chipset in the Ainol Novo 7 Basic sent out a press release trumpeting the arrival of the inexpensive but powerful tablet running Ice Cream Sandwich. Google's Android chief Andy Rubin also lent his endorsement. 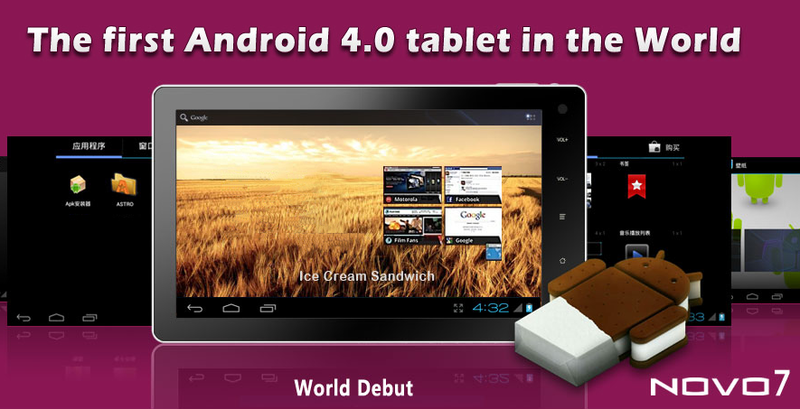 The Android 4.0 tab was officially available through what appears to be a Hong Kong-based site, Ainovo.com, but since the news broke it's been all sold out. MIPS says more Ice Cream Sandwich tablets will be in stock soon and the site will be updated. Other Novo 7 slates are available out there, but there's a catch -- most of them aren't shipping with Ice Cream Sandwich preloaded just yet. In fact, the Novo 7 with Android 4.0 mentioned in this week's announcement is actually based on older hardware. A newer 7-inch Ainol tablet -- the Novo 7 Advanced -- comes with a faster ARM chipset and is expected to get Ice Cream Sandwich in the near future. The Ingenic JZ4770 (found in the $99 ICS tablet announced this week) is slower than the Allwinner A10 used in the Novo 7 Advanced… and there are question marks over the compatibility of the MIPS chipset with some Apps. The ARM-based Novo 7 Advanced we sell is the better tablet and a much safer bet for the moment. At time of writing (8-DEC) there is already an Android 4.0 test release for the Novo 7 Advanced, so it won't be long until you can get Android 4.0 goodness on the Novo 7 Advanced! Futeko sells the Novo 7 Advanced for about $190 in Europe. A couple of sites claim to be selling the Ice Cream Sandwich tablet, but none of them are companies I can vouch for or was able to find much information about. A better bet if you simply can't wait -- though waiting is probably the best option -- is to look for a Novo 7 running Honeycomb from a reputable online retailer with a good deal on shipping. MIPS has confirmed that an Ice Cream Sandwich over-the-air update will be available for the Novo 7 Basic. As for an official North American release, the companies involved still aren't saying anything more than "the tablet will be available in other geographies within the next several months."